Just call them the "incredible aphid-eating machines." That would be the lady beetles, commonly known as ladybugs (although they are not bugs; they're beetles belonging to the family Coccinellidae, and they're not all "ladies"--some are male!). How many aphids can a lady beetle eat? Scientists figure around 50 a day. 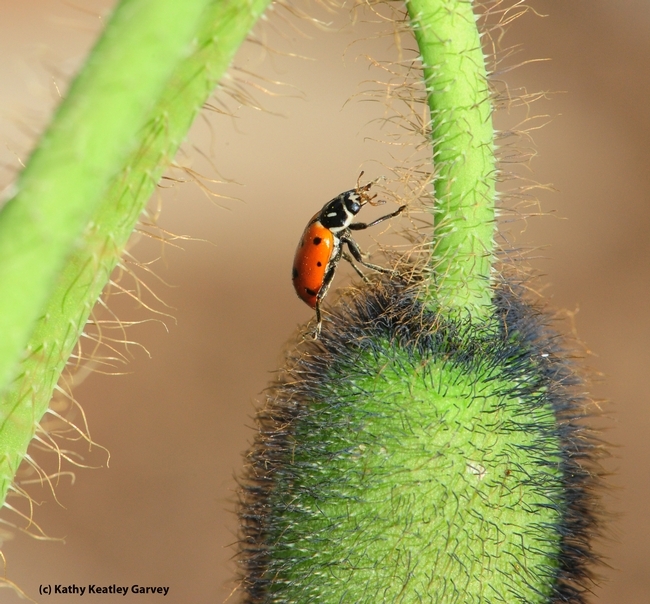 A single lady beetle can eat 5000 aphids during its lifetime, according to the University of Kentucky Extension Service. That's why they're called beneficial insects! 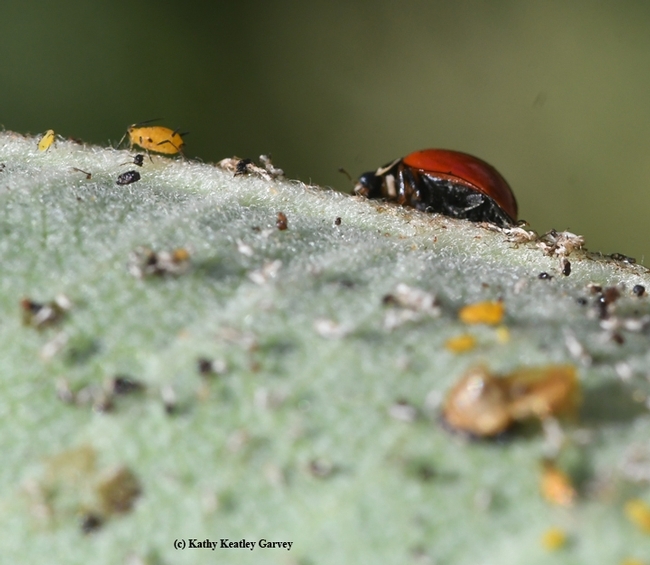 And it's not just the adult lady beetles that dine on those plant-sucking aphids. So do the larvae. Aphids. Maybe a 50-course meal? Mother to daughter: "There's a lady in here." Daughter: "A lady? Well, why wouldn't there be a lady in here? This is a lady's restroom." Mother: "Look right over there, on the wall." Indeed, there was a "lady" in the lady's restroom: a lady beetle. Family Coccinellidae. The damsel in distress was crawling up and down the cement wall searching for something it couldn't find. An escape route! So, I picked up the domed-wonder and transported it from Marin County to our Solano County home. I deposited the little traveler on an Iceland poppy. The lady beetle perked up, checked out its surroundings, and began exploring. Who wouldn't like to have a lady beetle, aka ladybug? 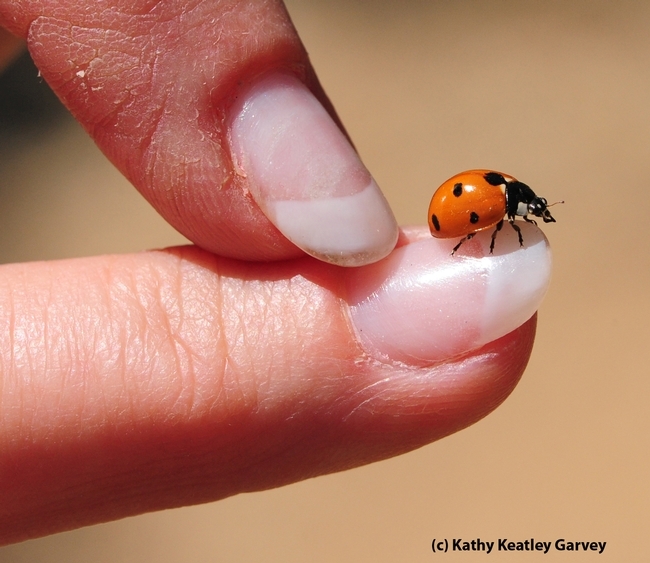 Although they're commonly called "ladybugs," entomologists call them "lady beetles." That's because they're beetles, not bugs. Nevertheless, who wouldn't like to have one? The California Grange traditionally gives away lady beetles at the annual California Ag Day, held around the first day of spring on the west lawn of the state capitol. These beneficial insects gorge on aphids and other soft-bodied insects. We took ours home and placed one on a Iceland poppy stem and another on a rose bush. And then we photographed them as a sort of "proof of life." Out of the container and into the garden. Go get 'em, lady beetles! 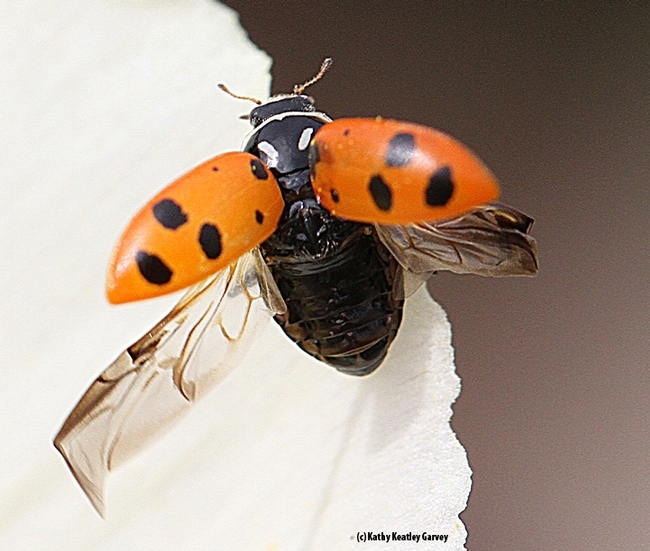 Lady beetles belong to the family Coccinellidae, derived from the Latin word coccineus, which means "scarlet." 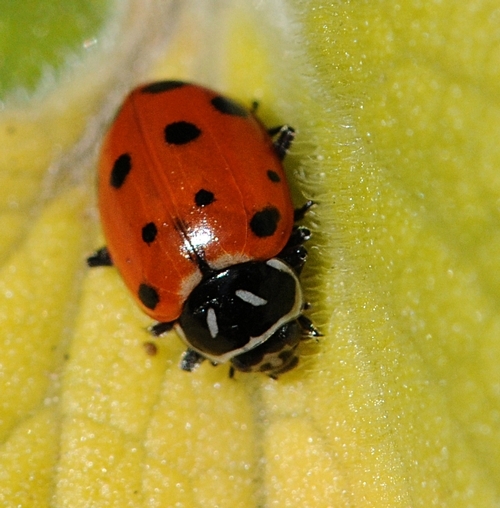 However, not all lady beetles are red. Some are red, yellow, black, gray, or brown. Some have spots or stripes. Some have no markings at all. They're sometimes confused with the spotted cucumber beetle, a yellowish green dome-shaped insect with black spots, but that one is a pest. As for the lady beetles, we're promised more. 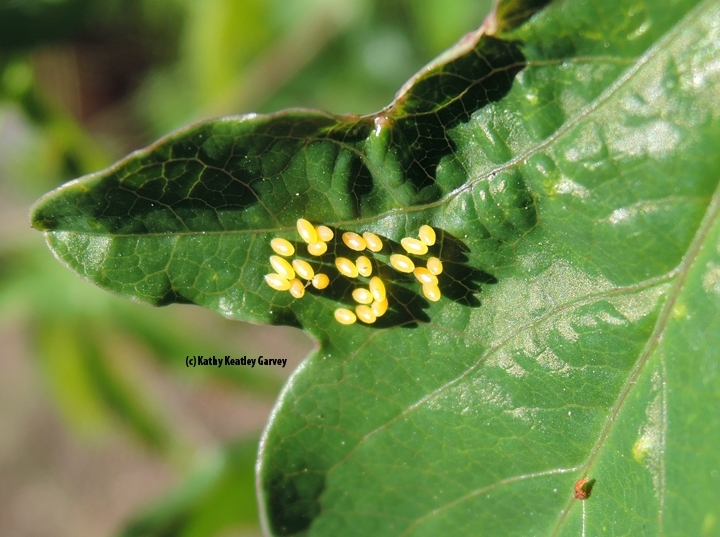 Last week we received a special gift--a cluster of 24 eggs deposited on our passion flower vine (Passiflora). 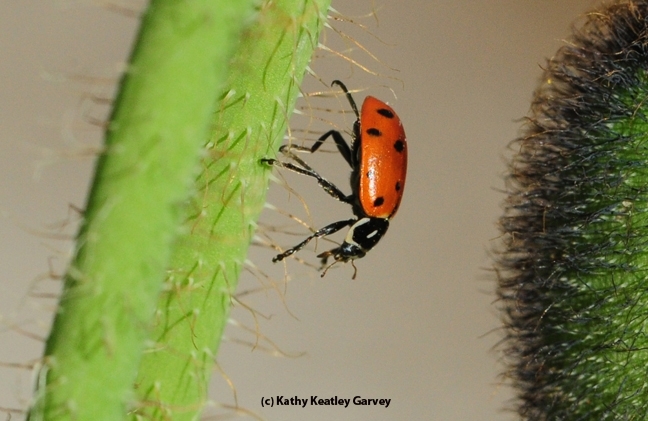 Consider the lady beetle, aka ladybug. It's not a bug, but a beetle. It belong to the family Coccinellidae, and scientists have described about 5000 species worldwide, and about 450 in North America. 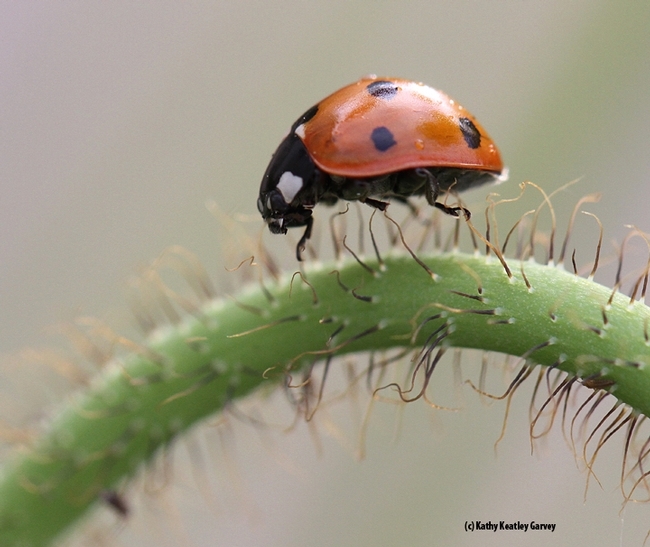 Ladybugs are not always red with black spots. The colors can be red, yellow, orange, gray, black, brown and pink. And, not all ladybugs have spots. Some have stripes and some have neither spots nor stripes. Coccinellid are omnivores, dining on soft-bodied insects such as aphids, as well as plants. Aphids? 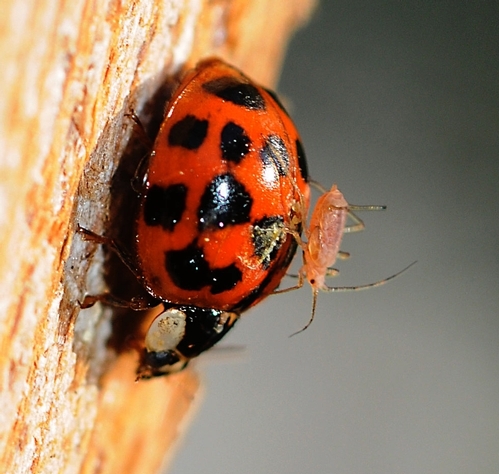 A single ladybug can eat some 5000 aphids during its short life span of three to six weeks. Ladybugs are considered good luck. If a ladybug lands on you, Lady Luck is supposed to smile on you. This ladybug (below) landed on me on the grounds of the Harry H. Laidlaw Jr. Honey Bee Research Facility on Bee Biology Road, UC Davis. I'm still waiting for Lady Luck. 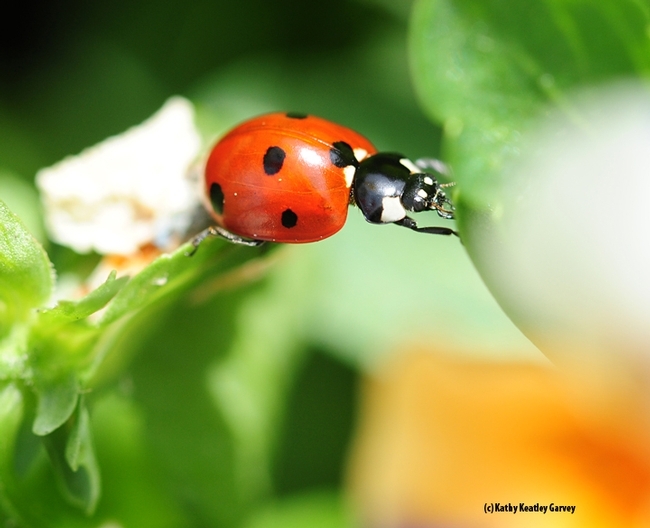 Ladybugs are easy to "spot." As soon as the weather warms and those dratted plant-sucking aphids emerge, here come the polka-dotted ladybugs. The prey and the predator. The pest and the beneficial insect. The bad and the good. Actually, many folks have already reported ladybug sightings. Facebook friends are photographing them and posting macro images. Ray Lopez of El Rancho Nursery in Vacaville said he's seen scores of them this season. The building that houses Fox 40 in Sacramento is resplendent with them. In fact, tomorrow morning (Wednesday, Feb. 24) senior museum scientist Steve Heydon of the Bohart Museum of Entomology, UC Davis, will be interviewed by Fox 40 on that very subject: ladybugs! Look for a 7:20 a.m. live interview. 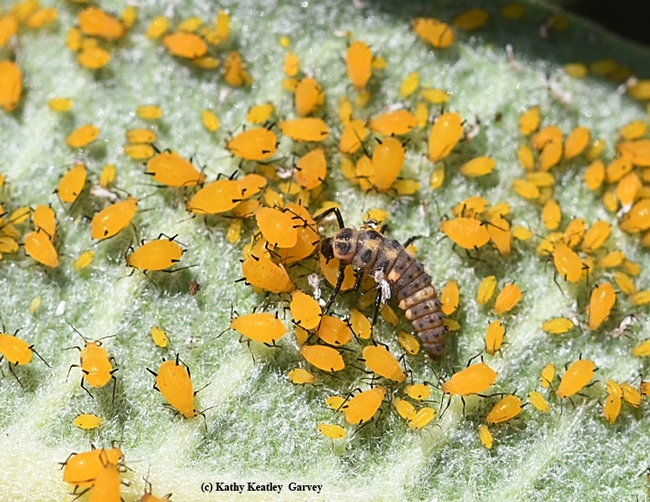 An article in today's Science Daily calls aphids "the mosquitoes" of the plant world. That's because they depend on the "blood" of plants to survive. David Stern, professor of ecology and evolutionary biology at Princeton University, is quoted as saying "Look at this little insect, sitting on a plant and sucking plant juices. You don't realize that it is involved in a historic battle with plants for access to its life blood. All its genes have evolved to allow it to exploit its feeding relationship." The article, about how an aphid's genome reflects its reproductive, symbiotic lifestyle, points out that an aphid can reproduce both sexually and asexually." That's certainly a key factor in the aphids' evolutionary success. All the more for the hungry ladybugs. So, whether you call them "ladybugs" or "lady beetles" or by their family (beetle) name, Coccinellidae, they're found worldwide, with more than 5000 described species.